If you've got a spare €62,000 burning a hole in your pocket then today is your lucky day, especially so if you also happen to be a big fan of Ubisoft's Assassin's Creed franchise of stab-'em-ups. That's because prestigious French jeweller Tournaire has created the Assassin's Creed: Origins Utopia headphones, a set of custom-designed, handcrafted cans available in strictly 10 limited edition units worth €50,000 each. 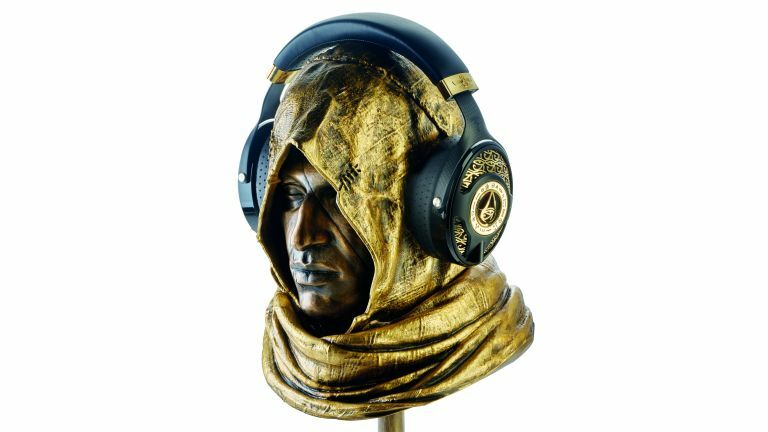 Naturally, owners of the Utopia can also drop €12,000 extra to land a bronze head of Bayek - the protagonist of the new game - too, upon which they can store the headphones when not in use. And that high €50,000 price largely comes courtesy of those 18-carat gold elements, which lace the ear cups and headband. For those looking to drop the cash, the Utopia can be viewed and purchased at Tournaire's boutique in Paris. So, there you have it, the assassin's choice of cans is now available for a king's ransom. Hey, and what's more, if you pick up that delightful bronze bust too then you'll have the perfect weapon to bump off the horde of jealous gamers looking to rob you blind.